Science and Engineering the 9th International Student Home Coming Day has been held successfully. In the afternoon of Saturday, February 16th, the 9th international Student Home Coming Day was hosted by the College of Science and Engineering and the Graduate School of Natural Science and Technology (GSNST). This year, 5 alumni of GSNST working in Japan came to their old campus to share their experience with their juniors. 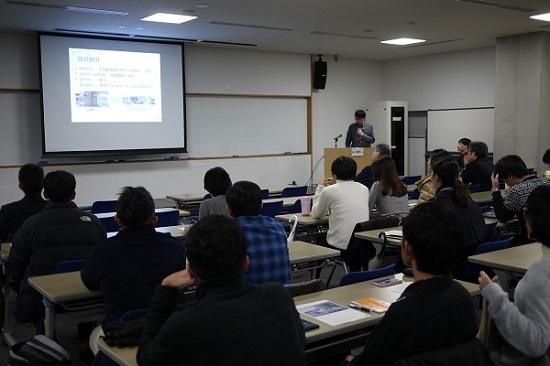 In the first part, 3 alumni, one from MHPS Control Systems Co., Ltd. in Yokohama, one from Komatsu Ltd. in Osaka, and one from Denso Co. in Aichi, made speeches on their experience of job hunting and working in Japan. 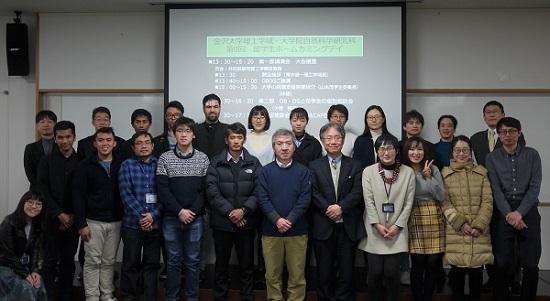 At the last part of the part one, career support systems and programs provided by Kanazawa University including “Kagayaki-Tsunagu” Hokuriku–Shinshu Employment Promotion Program for International Students were introduced. In the second part, the alumni and students had chance to talk in person in Chinese or English. Then we moved to the reception held at YABU&CAFÉ TAN and enjoyed talking over foods and drinks. Thanks to our excellent alumni, this event was so successful. We believe that the attended students could obtain clearer vision of and good insight into employment in Japan.